On the way to find the Ice Lilies, they hear some beautiful music and stop to investigate. They meet a young faun crying alone in the forest. The faun’s name is Winter, and she’s upset because she’s under a spell that causes anything she touches to turn to ice. Winter asked for the spell as a favor from the Ice Witch last Wassailia, because she wanted to be special. After she froze her pets and realized she couldn’t hug her family, she tried to get the spell removed, but the witch only grants wishes on Wassailia, and only if you bring her a special gift. So Winter is also on the search for Ice Lilies, and they all head off together. They finally find the Lilies (Winter’s power comes in handy on the way) but they’re up in the trees. Clover and Whiskers go after them, but after getting some, Clover falls. Winter catches him without thinking and he’s immediately trapped in magical ice. They all rush to the Ice Witch now, but she decrees that she has plenty of Ice Lilies and their gift is not special enough. Winter runs off, distraught, and Sofia doesn’t know how to help her. At this point, Sofia’s special princess power activates. As you may recall from the other holiday episode, Sofia is sometimes visited by the grown Disney princesses with advice. 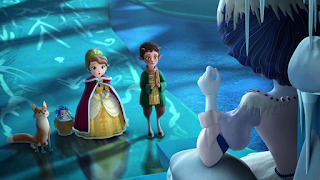 In this case her adviser is Tiana. I can’t even mind that she’s in her fluffy princess dress that she wore in the movie just long enough for there to be a ballgown for the doll, because she’s kind and smart and wearing a practical fur coat over the ballgown. 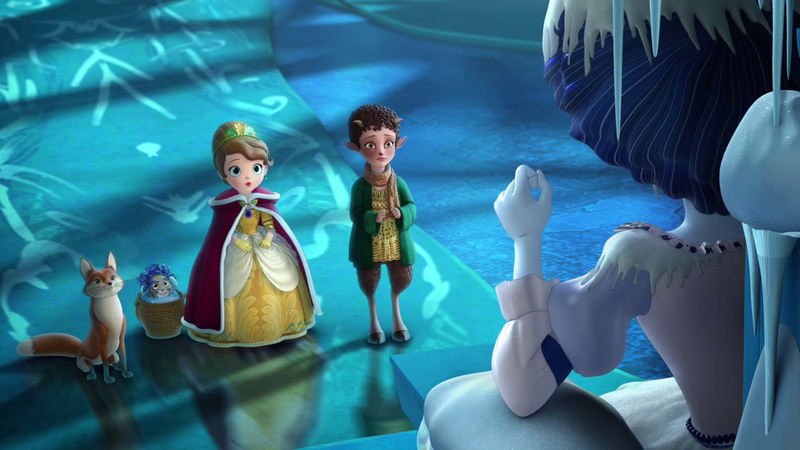 Tiana sings to Sofia about special gifts being given from the heart, and Sofia knows how to help Winter. She convinces Winter to play her music for the Ice Witch, and the witch is so touched by this gift that she removes the spell and rescues Clover. Winter celebrates by hugging everyone, then runs home to hug her family. Sofia returns home as well and gives Cedric the present she’d originally planned. He’s touched by her thoughtfulness and care, of course. This was a really sweet episode. The humor, drama, and earnest goodwill just carried me along. Erin even admitted to liking it. I don’t know whether the plots and writing overall improved in this second season or if this one was an outlier, but it’s a warm-hearted holiday confection.